DO YOU REALLY UNDERSTAND THE FOOD YOU’RE BUYING & EATING? If you’re serious about your fitness and health goals…you’ve got to get serious about not only the food you eat, but the food you buy! 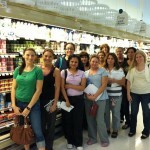 Join Body Project on a tour of your grocery store and we’ll make sure you have every bit of information you need to make the best food choices for you and your family! – Which “healthy” breads you are probably buying that are actually really bad for you. Premium Monthly Members: 20% OFF! Group tours are limited to 8 participants to offer the best experience. Have a group of colleagues, friends or family, girl scouts or other organization interested in participating in a private tour, contact us!